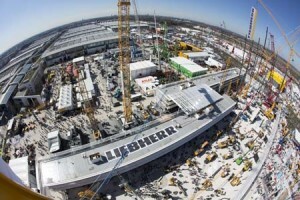 For the year 2013 Liebherr forecasts a group turnover of €9,086 million (US$ 12,539 million), equal to the 2012 figure. In the construction machinery and mining equipment segement the manufacturer anticipates a decrease of around 4 %. Turnover according to current forecasts will be around €5,620 million ($ 7,756 million, down €249 million ($ 344 million) on 2012. Included are the earthmoving, mobile cranes, tower cranes, concrete technology and mining divisions. Growth to compensate will be from turnover in the maritime cranes, aerospace and transportation systems, machine tools and automation systems and domestic appliances divisions, together with miscellaneous products and services that include the components division business areas where turnover will reach €3,466 million ($ 4,783 million), an increase of €245 million ($ 338 million) or 8 %. Liebherr estimates that the total workforce will increase by 1,870 in 2013, to a total of 39,670. In outlook, Liebherr said it views the coming 2014 business year with restrained optimism. In its initial forecast for 2014 it expects total turnover to reach a volume similar to that achieved in the previous year and that the workforce will probably increase slightly.